Here are some online and offline resources for civic activism. 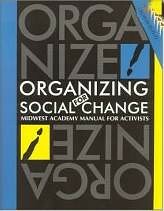 “Organizing for Social Change” by Kim Bobo, Steve Max and Jackie Kendall of the Midwest Academy, Chicago. “The Activists Almanac” by David Walls.